Eva's Cottage is a 3/4* bedroom fully furnished house in a sheltered position with a pleasant rural north facing outlook. * The fourth room is an annex which doubles as a second living space - complete with new second bathroom and second TV with Netflix. We are 15-20 minutes drive from Kerikeri, Paihia and historical Waitangi and Russell being the hub of the Bay of Islands. So much to see - Kawiti Glow Worm Caves, Wairere Boulders, Ngawha Springs Thermal Pools, beautiful Long Beach a ferry trip and pleasant walk through Russell; the Old Packhouse Saturday Market Place, Makana Chocolate Factory - the list goes on! There is easy access to the house and you can park conveniently right outside the front door. Plenty of parking for your boat and space for the kids to run free. Many great places to eat out in Kerikeri and Paihia but Eva's Cottage also has a fully equipped kitchen with rice cooker, sandwich maker, pizza man and slow cooker. Linen and towels provided and linen is washed in hot water and ironed too. Are you moving to the local area and looking for somewhere to call home while you get settled? This is the place ! There are good mid-term rates available off season (May to October) by negotiation. Never felt more welcome . Beautiful accommodation a credit to Frances and Family. We will recommend EVA S COTTAGE to all our friends and Family. Prime spot to many places we saw over our 3 days there.. We felt like we were at our own homes as soon as you walked through the front door. Beautifully set up and comfortable. Please visit here, you will not be disappointed at all. Well set up and comfortable. Close to everything in the area. Peaceful country surroundings. We totally enjoyed our stay here. The cottage is furnished to a high standard of comfort. We loved breakfast on the porch. Kerikeri is only 15 min away. 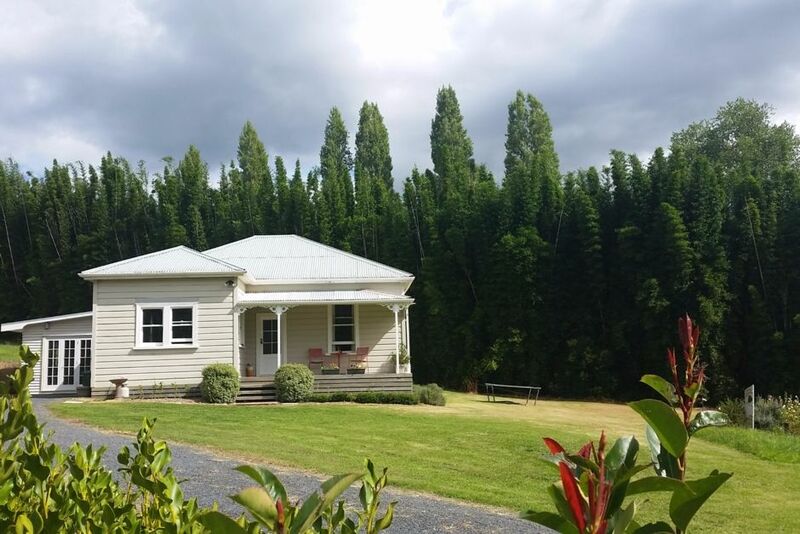 We had a wonderful stay in Eva's Cottage - it was the perfect place from which to explore Kerikeri and Northland. A very sweet cottage in beautiful surroundings, with excellent hosts. And very friendly chickens! We noticed that other reviews mentioned road noise but we didn't find it a problem. We enjoyed sitting on the porch in the evenings. A trampoline was an extra bonus. It's a very special place.